Seemingly out of nowhere, Mountain Lion, the next version of the Apple's OS X operating system, is formally in the works and will be on our computers later this summer. Most intriguing is that it will further blur the lines between iOS and OS X, bringing apps like Messages, Notes, and Reminders along with utilities such as Notification Center and—finally—AirPlay mirroring from your Mac. Based on what Apple is revealing for now, many of the new features revolve bringing iOS functionality to the desktop. Not only do these new apps and features behave the same as their iOS analogs, but they seamlessly sync with those apps as well. Oh, and one other significant change: OS X updates are going to happen yearly now. But let's take a look at what's new right now. Messages will completely replace iChat, allowing you to trade iMessages with iOS devices (but don't worry, it'll still support AIM, Gtalk, etc.). 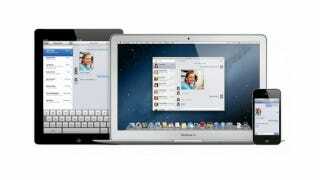 FaceTime has also been integrated into Messages, further consolidating all of Apple's messaging platforms. This could be the end of the awkward divide between iMessage, iChat and FaceTime. The OS X version of Notifications behaves much like the iOS iteration, witha full drop down menu and banner updates. From the looks of things, Notification Center is looking to completely and utterly upstage Growl, which has served as the de facto OS X notification framework for years. Much like Apple is going after Growl, they're also going after services like Dropbox in a more pronounced way. Specifically, you can now upload documents from Mountain Lion to iCloud. Anytime you make a change to the document, any device accessing the doc will see the changes. But according to The Verge, Apple still isn't giving access to an iCloud file browser to see everything you have in your cloud. Finally, we now have the ability to push our computer screens to our televisions (provided you have an Apple TV). Mirroring is limited to 720p resolution and stereo audio, but that should be fine for most. Sadly the feature seems limited to mirroring, and not pushing system (or app-specific) audio to AirPlay speakers or Airport Express, but it's at least a step in the right direction. The same Reminders app that came to iOS 5 is now coming to Mountain Lion. The GPS functionality isn't here—not that it would be entirely useful if it were—but you can search through your reminders, set due dates and receive alerts. They basically ripped the to-do list out of iCal and made it more robust. Write down a few notes on the mobile Notes app, and they'll appear on your desktop. The desktop version, however, has a few new tricks. You can pin notes to your desktop (remember stickies before they got pushed into the widgets layer?). You can also drag and drop images into notes and send those off to other people. Gatekeeper is a simple, preemptive security barrier for people worried about downloading malicious programs. Malware isn't much of a problem on OS X, but if you're worried, Gatekeeper will let you assign one of three set download levels: anything, Mac App Store only, or programs from trusted developers plus everything in the App Store. If something violates the security level you've set, you won't be able to install it. This should go well with the grandparents. Twitter is now built into OS X. Mountain Lion will let you, say, tweet photos and links directly from iPhoto and Safari, and every time you're mentioned or hit with a direct message, you'll get an automatic notification—no extra Twitter software needed. The iOS Game Center has always been a neglected backwater territory for Apple, so Mountain Lion is pushing it right onto your desktop. You'll get to plug into the same leader boards and friend-finding available on your phone, but now it's on your laptop! Hey! It's unclear whether just Mac gamers will be able to go at it with each other or if iOS is invited. You know that arrow icon on your iPhone? The one that you click to share photos from your albums? Now you'll be able to do that same thing throughout OS X apps, too: emailing your notes, uploading your videos, and tweeeeeeeeting will all be done from one handy icon.